It was finally here - race day at the Abu Dhabi Grand Prix! We were all in for a full day of racing, with hopes of a double Hamilton win and Championship. We didn't get everything we were hoping for, but it ended up being an amazing day all the same. Sunday was the day this whole trip had been planned around - race day at the 2016 Abu Dhabi Grand Prix! 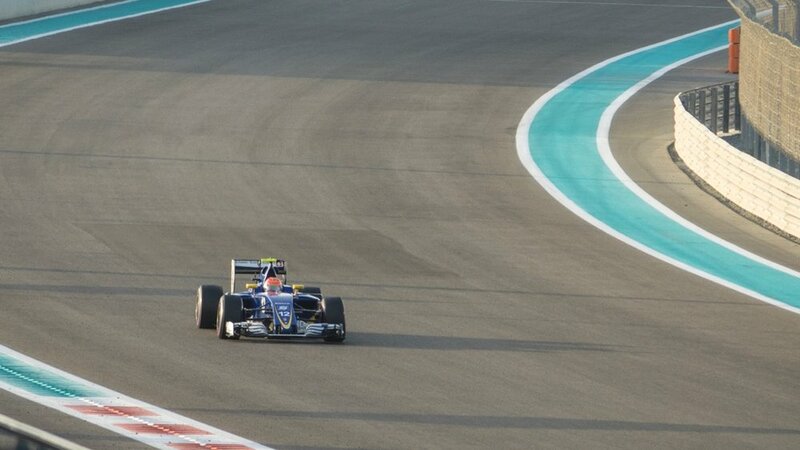 We had Hamilton on poll, the weather was amazing, and there was hope for an excellent end to a great few days at the Yas Marina Circuit. As the racing didn't really start until about 1:00, we also had a nice leisurely start to our day. As has become our custom, we walked over to Tim Horton's for some breakfast. We had something to eat, then headed back to the hotel and got changed to head down to the beach. We spent a couple of hours swimming in the ocean and relaxing, before heading up to shower and get ready for the big day. Not one of my pictures, but we really didn't take any pics at the beach at the hotel in Abu Dhabi. We ended up having to walk back to the Mall to catch a cab, and had to wait in a lengthy line before we could get in a taxi. It was just after 1:00 when we got to the Circuit, and the GP3 race had just started. We headed up to our seats, and watched the rest of the race. For whatever reason, the GP3 cars were the loudest of the weekend, and we both used earplugs to dampen the loud sounds of the cars. It was pretty short race, but there was lots of good action. 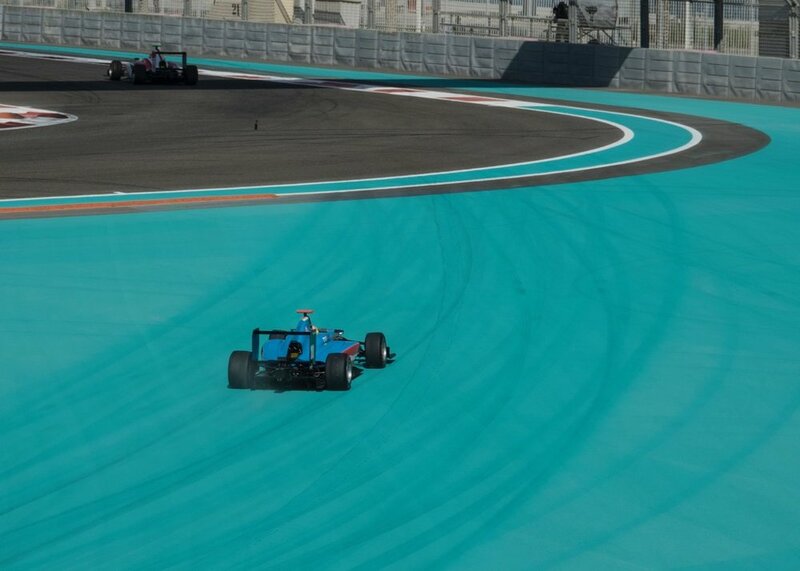 The GP3 cars out on the circuit. The action right out front of us. After the race we headed down to the South Oasis and had some lunch. The food wasn't that great, but it worked. After lunch, we went back to our seats and watched the final GP2 race. This was another fun race on the Formula 1 feeder series, and also had lots of good action. There were some near crashes, and lots of overtaking which made for fun watching. That race took us up to about 3;00, and the start of the festivities around the actual Formula 1 race. The lone Canadian driver in all of the different classes of racing. 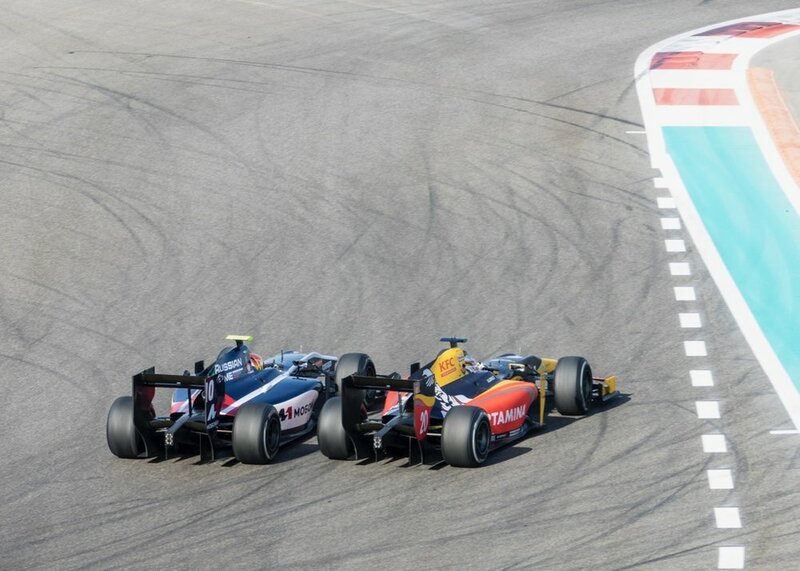 The GP2 action was underway! Our locatiuon on the track was great - lots going on! Not every car made the turn come race time. ...and that was the end of his day. Not how he expected his race to end. Lots of equipment around to get the cars off the track. On the truck, off to the garage. The party boats were starting to fill up for race day. ...but not everyone made it out of the final part of the turn. Another good battle right out front of us. 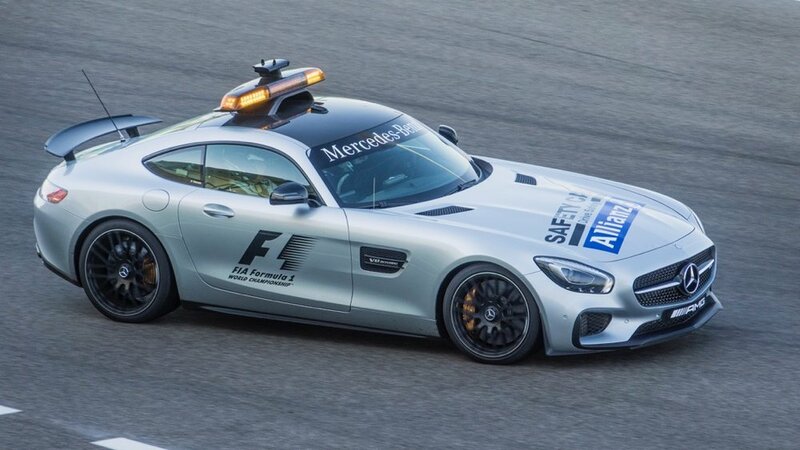 End of the race, and the safety car was out doing laps. the Formula 1 equivalent of a zamboni, getting the track ready for the big race. How the rich and famous get to the race. There were helicopters flying in all afternoon. There was lots of activity going on in the pit lane that we couldn't see, but could watch on the video screen nearby. 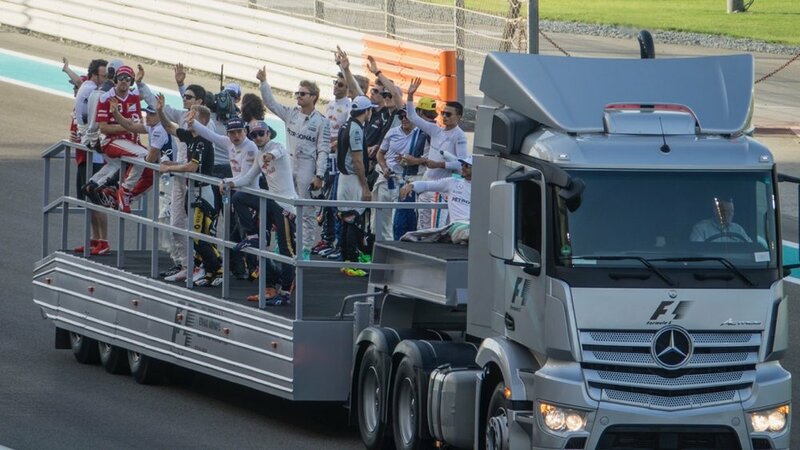 Once they got through those activities, the drivers did a track parade where they all sat on the back of a transport truck and drove around the whole track, waving to the crowds. 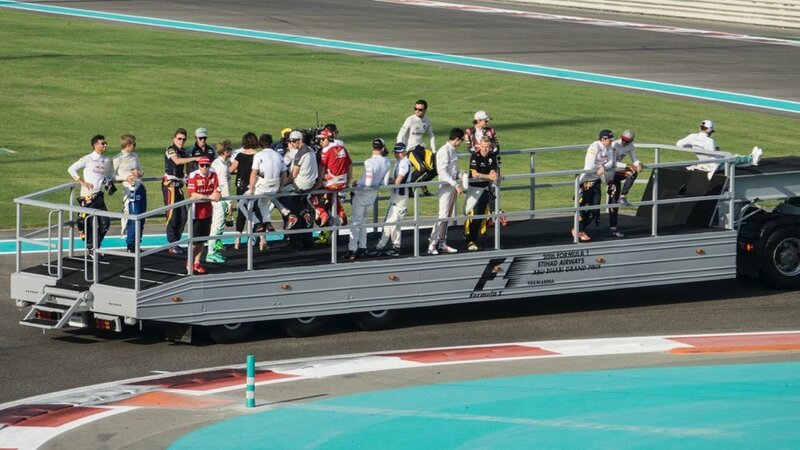 All the drivers on a truck, doing the drivers parade before the race. The guys seemed to be having fun, waving to the crowd. Lewis Hamilton chilling out at the front of the truck. One last look before the headed off away from our area. Once that was done, it was time for the real action to get underway! They did the national anthem, and then there was a really cool fly by with an Emirates A380 and the jets from the day before. Lots of colored smoke! With all of that out of the way, it was time for the race to begin! 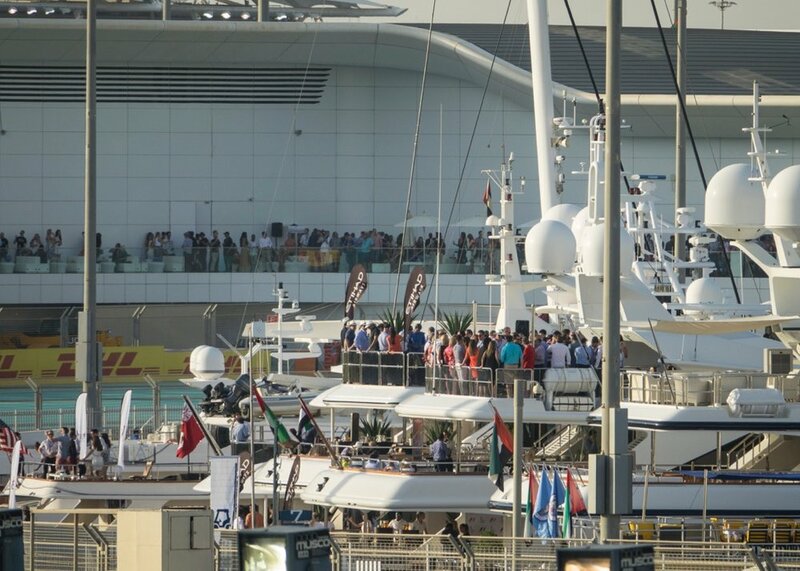 The boats and the balconies of the Viceroy were jammed with people. 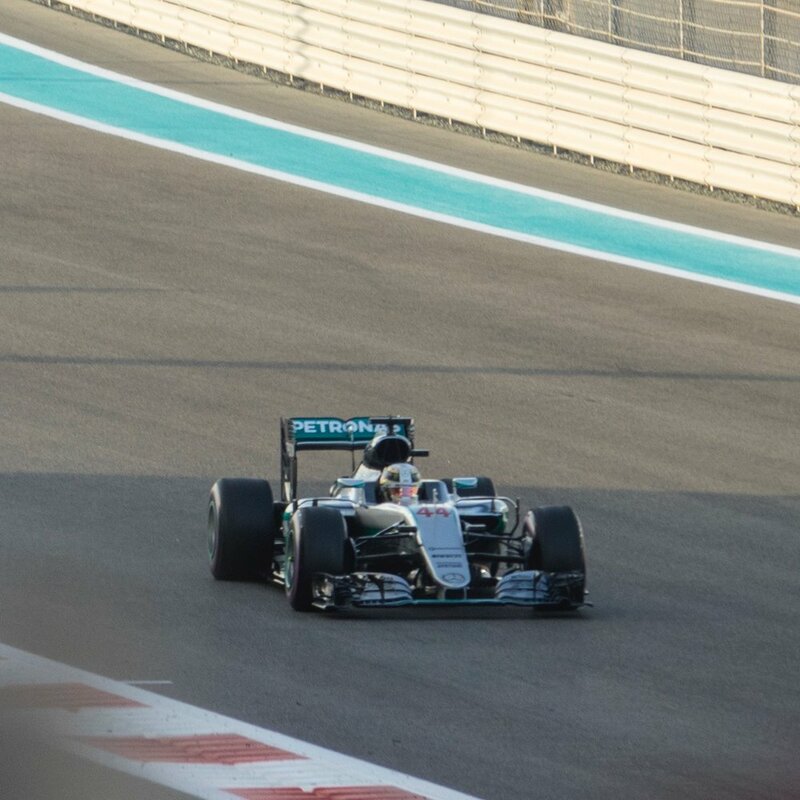 Hamilton doing some warm up laps before the race. The A280 leading the fighter jets in the fly-by. The trail of colour over the race course. The planes heading off into the distance, signaling the start of the race! The balconies of the Viceroy were jammed with people. Hamilton got off to a good start and was in the lead. There was some sort of crash at turn one, but we obviously couldn't see it from where we were, other than on the video screen. By the time the cras got to us, everything had evened out, and they went flying by. And the race was underway! Hamilton out in the lead. I put the camera away to enjoy the race, so not too many pics from the race itself. From there on, it was a matter of watching the cars go by, and trying to follow the action happening at other parts of the course based on the video screen and the announcers. 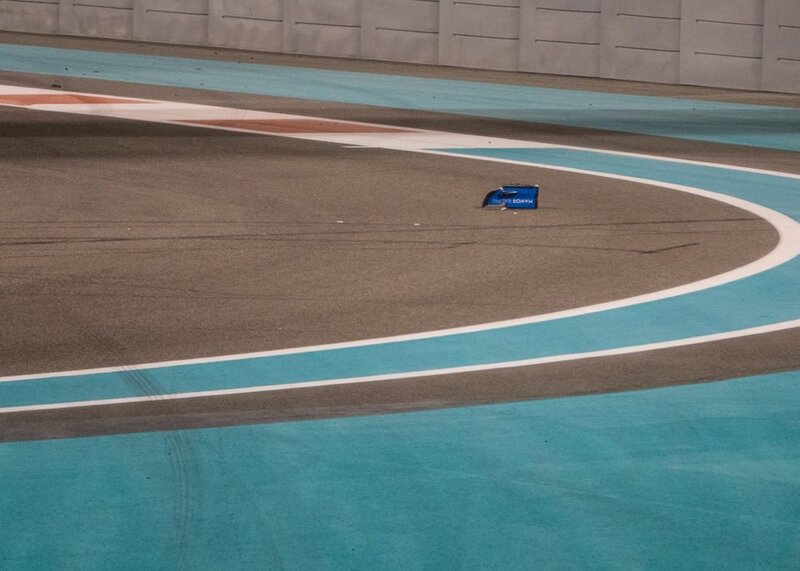 Our section of the track ended up being really fun - there's a long straightaway with a DRS zone to the left, then the cars have to brake hard into the chicane, ahead of a tight turn. It makes for a wild spot for some overtaking attempts, and we had a few good ones, including one crash than cost a car its front wing. There were a bunch of attempts at overtaking - most failed but some worked. We also saw two cars die in that section and a couple of times cras couldn't make the turn and ended up on the big turquoise section in front of us. All in all, it was very exciting and lots of fun! The start of the race! The out lap, with Hamilton in the front, warming up the tires. The action in front of us was amazing - wheel to wheel racing! 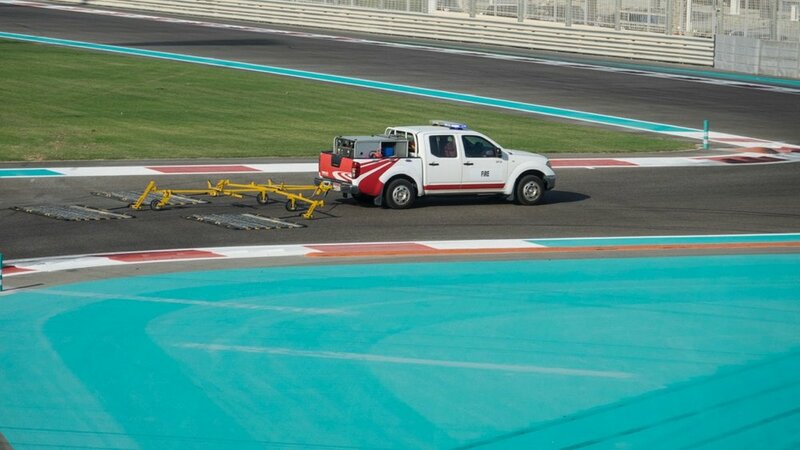 Not every car made the turn at the chicane. A view of the Yas Viceroy at night, all lit up. Except this brave guy ran out onto the track and picked it up! 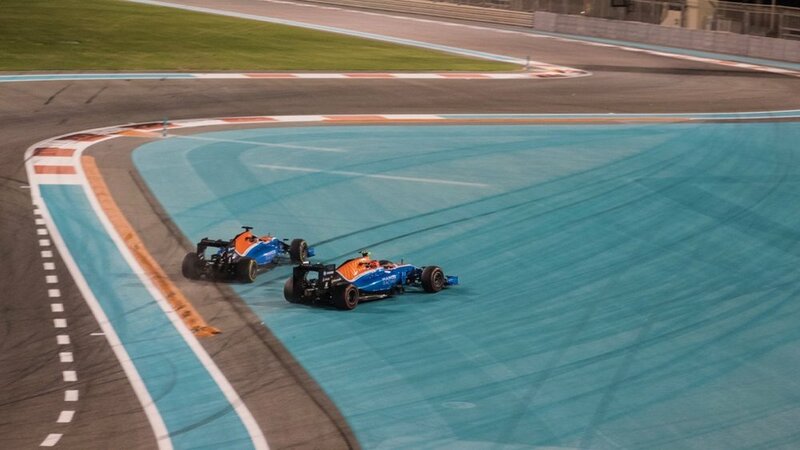 ...but they missed the chicane and ended up on the blue. A bit of a pano of the course. Eventually the race came to close, with Hamilton winning and Rosberg coming second, securing the driver's championship for Rosberg. Not the outcome we were hoping for, but still a great race and an amazing end to the Formula 1 season. We watched the closing ceremonies on the video screen, letting the crowds dispose somewhat. One last view of the South Grandstand as we headed out. After heading out, the lines for the buses were insane so we decided to walk over to the concert venue for the Rihanna concert. It ended up being a very good choice, as the streets were crowd locked with traffic trying to get out. I think we beat the buses over the 3.5 km from our South Grandstand to the concert venue. Once we got there, it was pandemonium. The lines were 3x as long as the previous days, and so we decided Rihanna wasn't worth the hassle and skipped the concert. A look down on the Oasis after the race. We cut through Ferrari World to get over to our taxi stand, only to discover no cabs and a huge line up. Seems other people knew our secret. We split up and Justine went to try and find a taxi outside the mall, while I waited in the line. She was more successful, and swung by to pick me up and we headed home out of the insanity. The back entrance to Ferrari World. It was about 8:30 when we got back to the hotel. We hadn't had dinner yet so we went down to the sports bar to have a drink and some food. We needed up watching the Manchester United/West Ham soccer game's second half while we ate, then headed back to the room to back as we were checking out in the morning. The Abu Dhabi Grand Prix was an amazing event, and I am so glad we came. The venue is spectacular, the race was a riot and we had a great time while we were here.